The poor little kittens did lose their Mitten and boy did he punish them for it. Last night was indeed Josh Mitten’s night. He has told the Cables faithful “give me the service and I will score”…….not only did he bag a hat trick but he played in almost every position on the field with the exception of goal! (and I am pretty sure if he had been called on to go in goal, he would have saved every attempt too) His efforts on the pitch were supported superbly in midfield by Tobin and Fleury, the trio’s diligence belied their age. Joshy himself admitted that they were playing like they had lost 20 years between them. For the Liverpool fans who avoided the Reds decimation at the hands of a Magic Roundabout character by venturing to Hope Street……just remember, it was a Manc who put the smile on your faces on the anniversary of Shanks’ death. Went up to Hope Street to try and catch a glimpse of my hero. He entered Hope Street like Collosus, shielded only by his henchman and minder, Craig Fleury. No sign of his other sidekick, Tobin, so I was able to get within swooning distance as he strode towards the changing rooms dressed in his Cables Tracksuit, his hair grown out of the skin head style he was sporting just a couple of weeks ago. Like Samson, his hair appears to be his strength. Just my bad luck that he is actually playing tonight!!! Several fans standing close to me must also be smitten with mitten, because they express their horror that he is on the pitch, presumably, like me, they wanted to be able to get as close to Joshy as the Garforth No. 4 did. Oh well, if he is playing I might as well stay, watch the game and delight in the vision of Joshy in shorts *swoon*. Joshy was magnificent….awesome! His other fans must be more stalkeresque smitten than I. Just his presence was too much for them to bear, they wanted him replaced, just so he could come and sit in the dugout closer to us. That could be the only reason they wanted him replaced since some of them muttered good game as he walked past but others were struck dumb as they basked in his charisma. Roll on Saturday when hopefully his other fans and I might be sittin’ with Mitten! Colwyn Bay, League Cup,Hope Street. Let’s be honest, no one cares much about the League Cup at any level of football.It’s now seen as something of an annoyance, a chance to blood youngsters or bring back previously injured players. Both Cables and Colwyn have made changes for this game, for Cables it’s about trying to gain a bit of confidence after Saturday’s dismal home defeat by Bamber Gascoigne. After twenty minutes Cables are three up- I’ll repeat that, after 20 minutes Cables are three up!! Two long range howitzers from Lundon and Morgan and a Rob Mac bullet header all but burst the Colwyn net. Even more promising is the chances Cables carve out, finishing from close range is still a problem but who’s complaining when you’ve already bagged three? Colwyn gather themselves and hit the woodwork twice before pulling back a late goal. Job Done though, we’ve grown, look the part….the league cup is fantastic, we love it. Leigh Genesis away, league game. Here we go here we go here we go…. Only three days after the Colwyn game Cables travel to the Land of the Orcs to take on the forces of darkness. Leigh, not quite Wigan, not quite Bolton, not quite earth come to that. Home of an under achieving Rugby League Team and a football team plummeting down the leagues so fast they are in danger of getting friction burns on their behinds. The team in question is Leigh (cough) Genesis, formerly Leigh RMI, and before that Horwich RMI. Like all teams who are very vocal in their ambition the next few dozen steps are usually backwards. Shouldn’t be too harsh, all fans would fall in line behind such an ambitious plan while the going is good, if a mad Scotsman came to Cables promising Scottish Premier League Football at Hope Street by 2015 I’d be out buying my kilt tomorrow. 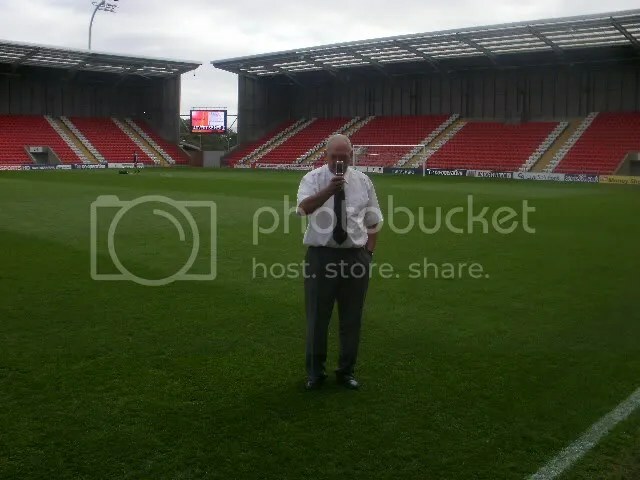 There’s no denying the Leigh Sports Village Stadium is an impressive sight.All gleaming concrete and steel, nice, clean, surgical…..all that’s missing is the team of surgeons to wheel you into the dressing room for your triple by-pass operation. You pays your money and you takes your choice, I’m not a fan of these sort of grounds. I like the history of a place to be held in its crumbling terraces and creaking stands.As with all new stadiums the stewards are numerous and over officious , all part of the paid job I suppose. The price of the food is extortionate by non league standards, a coffee at £1.70, a pie at £2.70 and a packet of crisps at 90p. It’s an expensive day out for your non league aficionado in Leigh. The fans are hoarded into one small section of a stand, leaving the rest of the huge ground as quiet as the Grand Canyon at 3am on a Sunday morning.Nice pitch though, if you can’t play football on this you can’t play football.Three Cables fans used that exact quote before a ball had even been kicked. Barely a minute into the game Cables concede a penalty. Young Paul Cliff makes the mistake of challenging for a loose ball in the area and a Leigh player duly obliges with the dying swan routine.In time Cliffy will learn that any contact in the area now merits a penalty kick. 1 down. I forget the time line but Cables are two down fairly quickly as a free kick is boomeranged up and around the wall and just inside Cables near post. Cables fluff a glorious chance to pull a goal back and as is the norm they quickly concede another.I forget if the third goal was the 25 yard free kick or the clean run on goal so I’ll get both out-of-the-way now.4-0 down before half time. Cables’ dilemma is summed up as Tobin beats three Leigh players in the centre circle and holds out his arms in exasperation at not finding a single other Cables player wanting the ball. Half time. As always in times of depressing anxiety the need for comfort food is huge, even at these prices I indulge in a pie and a coffee. Not surprisingly the warm glow of nostalgia is over taking a couple of Cables fans as they start to talk warmly about some of last season’s squad.A few of us dampen such ideas immediately.The current squad may not be good enough but at least they have time to improve, last year the performances got worse as the season progressed.There’s even a favourable comparison with the infamous Boston away game and today’s performance. The key difference is we could and should have been 15-0 down in Boston after 30 minutes- today Leigh have scored from every chance they’ve been given. It just confirms the old maxim- the past just keeps on getting better. There’s no real change in the game’s flow during the second half. Cables are laboured, Leigh comfortable. Leigh are awarded a comical penalty as Lundon slides in for a perfect tackle to poke the ball behind for a corner, only tofind the referee has awarded Leigh a spot kick. There is no Robbie Fowleresque sportsmanship from Leigh as they take the gift without complaint to score the fifth.They even have the audacity to celebrate. Cables fans entertain themselves with a discussion on the best way to commit suicide, Leigh fans accuse Cables’ Andy Paxton of eating all the pies. Given the cost of pies at Leigh is doubtful anyone but a Premiership player could acquire more than two. Leigh score a routine sixth, Cables don’t create much.The final whistle is something of a relief.Afterwards I get the customary “I didn’t think it was a 6-0 game” from a couple of Leigh fans. I wish I didn’t think it was a 6-0 game either, but the huge scoreboard and the enthusiastic tannoy announcer keep reminding me that’s exactly what it was…..
What a turbulent 12 months for the Cables.I’m not going to drone on about last season’s utter disaster because I’m trying to erase it from my memory. Safe to say I thought a clear out was the best way forward and I was pleased when Joe and Dave arrived. Fans should not underestimate the huge task ahead of the new management team, they took over a club where some of our best players had left and, quite frankly, some of the others weren’t good enough.We all knew it but it’s to the fans credit that we still backed the team until the end .Now we have to give Joe and Dave that same backing and we have to be patient. That’s right. Football fans are a notoriously impatient lot but no one builds a successful team from nothing in a day, a week, a month or even a season. It takes time to see if players are good enough and find the right blend. Sadly that means Cables steep learning curve is happening during the season and there will be some setbacks along the way, defeat is only a bad thing if you fail to learn from it. Already there have been the green shoots of early promise in some performances and most of the players seem to be of better quality than last year’s crop. For a start the team is actually playing more football as it should be played and the team seem to be more talkative on the pitch rather than criticising each other. Secondly we have seen a number of promising youngsters from the reserves knocking on the first team door. Last season it seemed the reserves side was a totally separate entity, now they are playing in a higher standard of football it’s a platform for talent to push for a first team place. And Joe has already had a good look at some of the lads– another step forward for Prescot Cables FC. Off the pitch things have been going well. The ground is looking better than it has for years thanks to the work of Cables fans volunteering their time, the pitch is looking good, The club is now a community interest club giving fans a real stake in Prescot Cables, the new website is one of the best in the league and the Tiger Talk forum has more users and more activity than 99% of non league clubs. The Fanzine may or may not be a semi regular thing , we’ll have to wait and see on that. Whatever happens in the months ahead we need to stick together. I’m optimistic that better times are ahead. Keep it Cables. How romantic you feel about the FA Cup is in direct proportion to your team’s involvement. If your team is still involved the FA Cup can warm the heart of the coldest cynic, if your team is one of the many fallen the FA Cup simply provides further evidence that all activities at some point end in failure. For a club like Prescot Cables there have been precious few chances to perform the clichéd giant-killing act in recent years. To get to the big clubs you have to win a few games against lower league sides, and these lower league sides have found Cables to be fairly easy meat I’m afraid to say. Last season Cables had to overcome a lively Congleton side before facing a Salford City side that had lost all 7 of their opening league games. Cables won 2-1 with a last minute free kick despite Salford playing us off the park. I wonder how romantic Salford felt about the Cup that night? 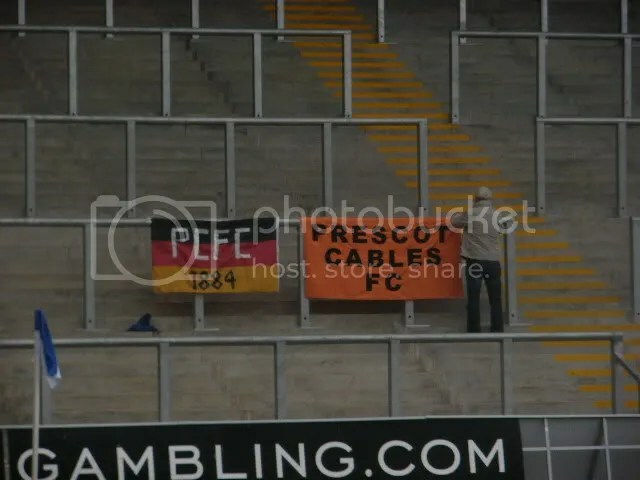 As we all know Belper Town massacred Cables in the next round in front of a very sizeable Cables away following. Cables were once again Giants who had kicked the bucket. This season looked more promising for Cables.For a start Cables had actually won a game, and on a Saturday too, and they had shown promise in the home draw against Trafford and the first half at Colwyn Bay. Cables travelled to a blustery Crilley Park to take on North West Counties side Atherton LR. Driving up there I had a good feeling about the game, my passenger did not.